Day 3: We hiked from Sam Mack Meadow to Seventh Lake, while visiting Fourth Lake, Fifth Lake, Sixth Lake, and Summit Lake along the way. Lots of lakes! This day was scheduled to be our easiest day, with only four miles to hike and a thousand feet or so of elevation gain. It was like a walk in the park compared to the day before. And that’s why we didn’t bother to get up super early. It was going to be a mellow day in the mountains. OK, I admit to waking up a bit early. I ventured out of the tent with my camera and took some photos of the dawn over Sam Mack Meadow. Then I turned right around and crawled back into my sleeping bag for an additional snooze. Sadly, it didn’t last long. Almost immediately, the two dogs started nosing around my tent, looking for someone to play with. All this sleeping was far too boring, in their minds. And besides, they were hungry. Dogs are always hungry, as everyone knows, and so I didn’t worry too much. Besides, I didn’t have their food. They soon discovered that my breakfast of Pop-Tarts didn’t really excite them. I ate it by myself, sitting in my tent in comfort. Then I lay back down and read my book, relaxing as the rising sun warmed the air. I was waiting until I heard signs of life from the other tent. Eventually the two of them came to life. They ate and got everything packed up, but we didn’t head out of camp until nearly 9am, which was pathetic. And we didn’t care. I was ready first because I decided to bring “no cook” food with me, so didn’t have to boil water like my son and his buddy. Plus, they decided to eat two breakfasts, because one breakfast simply wasn’t enough. Good thing I brought a book to read. So I sat by the stream and enjoyed the morning. And when everything was ready we double-checked the campsite (Leave No Trace!) and hiked on out. 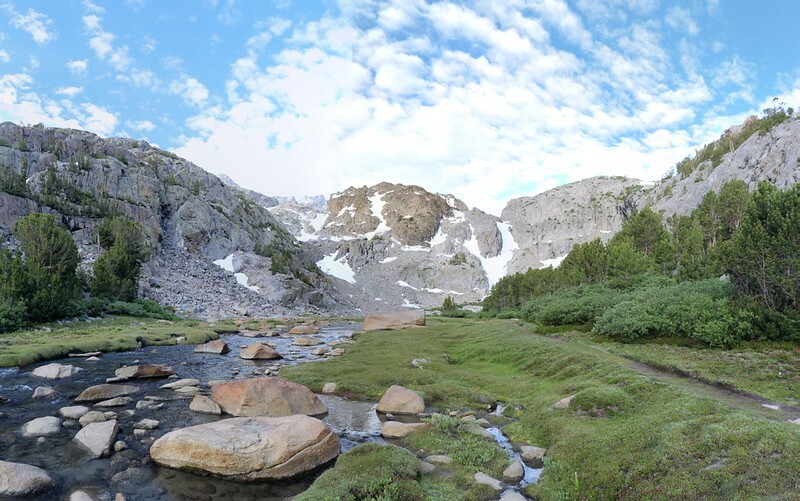 We descended the switchbacks below the meadow, crossed the creek, and climbed back up to the main trail. Then we turned left and continued uphill to the junction of the side-trail to Fifth Lake. About a third of a mile of easy walking brought us to the shore of the lake. And it was beautiful, with turquoise water like the first three lakes. 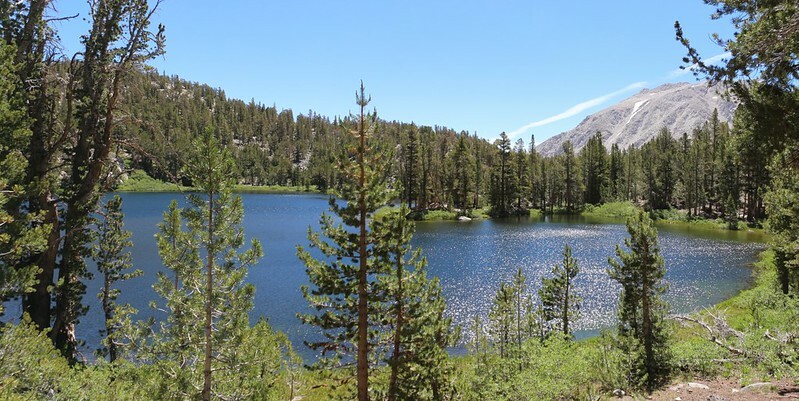 This color was caused by sediment from melting glacial ice, and we could see many patches of snow off to the west in the high mountains of the Sierra Crest. We put down our packs and took our first break here. We explored the shoreline and checked out some potential camping spots. 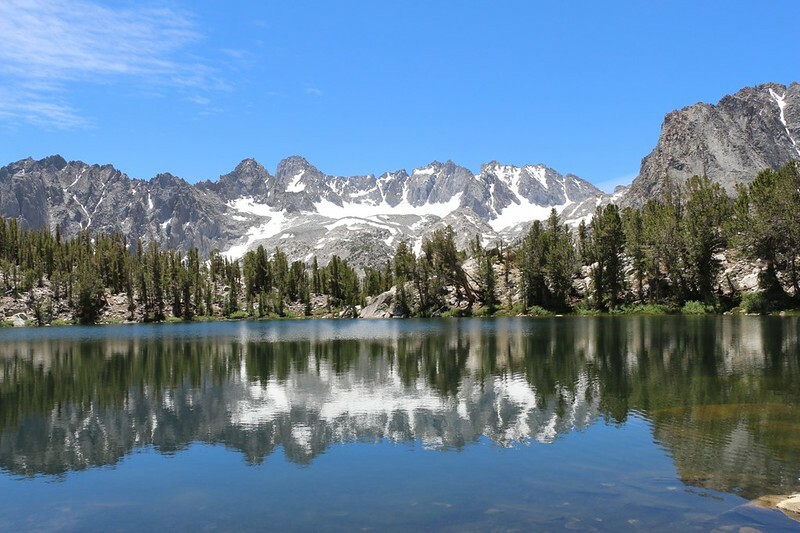 While we were there, we met three young ladies who intended to camp by the lake, and their leader (the most gung-ho of the three) said that she wanted to bag some nearby peaks. We told them about the campsite we found and also about our plan to climb Cloudripper Peak the following day. I also mentioned the route to take (that I had read on summitpost) where you first head for the saddle on the right, then turn left and climb along the ridgeline to the summit. 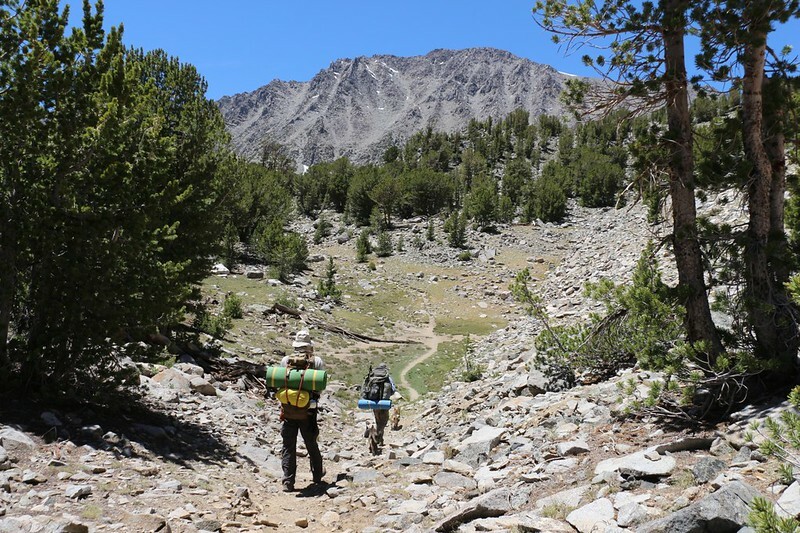 They headed off to set up their campsite, and we shouldered our packs and continued onward. We got back to the main trail and almost immediately came upon Fourth Lake. This lake didn’t get fed by glacial runoff, and was a more typical blue color. It looked like there were a number of excellent campsites around this lake, but we didn’t stop for a break this time. We just kept on hiking along, and the trail continued climbing. As we neared the trail junction to Summit Lake, suddenly we were overtaken by the three girls from Fifth Lake. They were only carrying day packs now, and were traveling light and fast. “Hi!” and “Bye!” was all they said as they blazed on past us. We wondered where they were heading, but figured that we’d probably see them again, since we would eventually be hiking that same way later on. 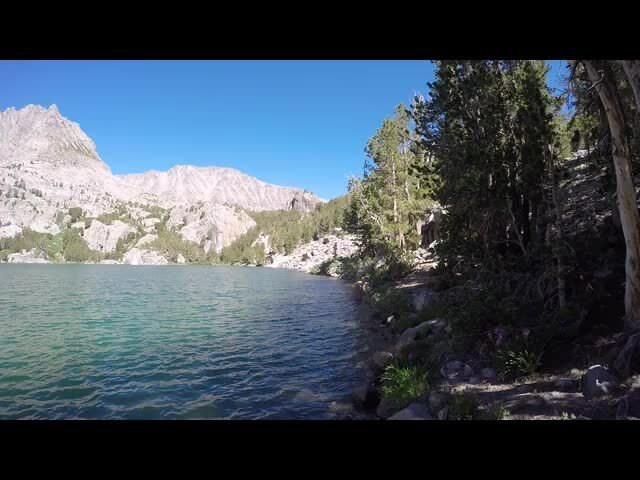 We, however, decided to take yet another side trail, this time to visit Summit Lake. And I sure was glad we did, as this was definitely the highlight of the entire day. What a beautiful lake! We took a major break here, and ate lunch along the shore. There was an extraordinary view west toward the Palisade Glacier from there. I took tons of photos and videos. The weather was warm so I took off my shoes and cooled my feet in the water. It felt great. The water wasn’t super-icy like many other lakes in the Sierra. Even the dogs tried a bit of swimming, mostly by paddling out to fetch sticks that we threw. Then they’d climb out onto a granite boulder and shake water everywhere, so you had to be careful where you sat. All told, we spent about an hour just relaxing and laughing and taking in the view. This was the life! 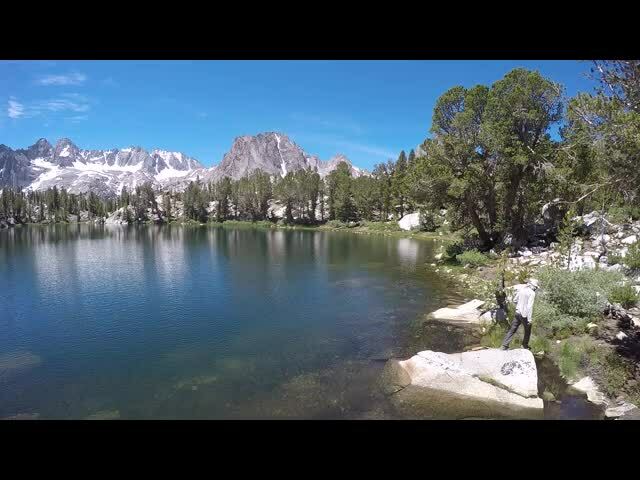 Video of the dog Roo fetching a stick thrown into Summit Lake – she was having a great time! Eventually we decided to get moving. For after all, there were other lakes to visit! We were also a bit over halfway toward our goal and it was already 1pm, so it was definitely time to hike onward. Good-bye Summit Lake! We made it back to the main trail and turned right toward Sixth Lake. We wondered if we missed seeing the three girls come back down the trail while we were lazying around the lake, but there was no way to know short of hiking back to Fifth Lake, so we thought no more of it. 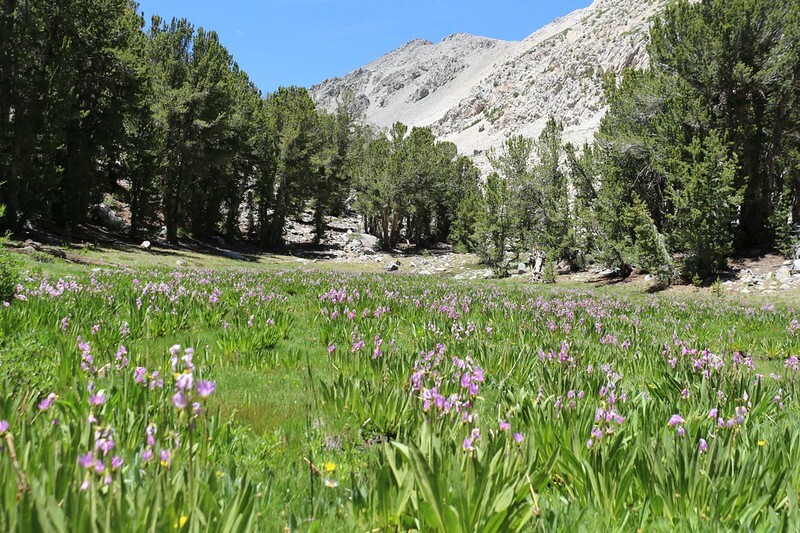 The trail gradually headed upward while taking the occasional dip into flower-filled meadows or down along small ponds and marshes. The afternoon sun was hot and the air was dry. We took many small breathers in the deep shade of the pines, letting the breeze cool us down. The trail popped over a ridge and I spied a small “photographer’s trail” off to the left. We were obviously high above Sixth Lake, but the trees were blocking the view. So I headed left and called the others to come and check it out. There it was, Sixth Lake, two hundred feet below us, complete with spectacular mountains in the background behind it. Beautiful! I took some photos and videos from this spot, and then we headed down the main trail toward the shore. I noticed that the map showed the trail simply ending, and the map was right. It never actually reached the shore of the lake, nor did it continue on to Seventh Lake. It looked like we’d have to head out cross-country to explore this area. And that’s exactly what we did. First we looked around the immediate area to see if there were any decent campsites, just in case there was no place to camp at Seventh Lake (which was where we wanted to camp). But there weren’t any good spots. Everything was either on a steep slope or had too many bushes, or too many rocks. So we continued onward to Seventh Lake after all, picking our way over talus and consulting the GPS when we weren’t sure which way to go. Eventually we made it to the lake. We put down our packs and wandered around looking for a good place to set up camp, and we found an obvious campsite along the northeast shore. So we grabbed our packs and set up camp. 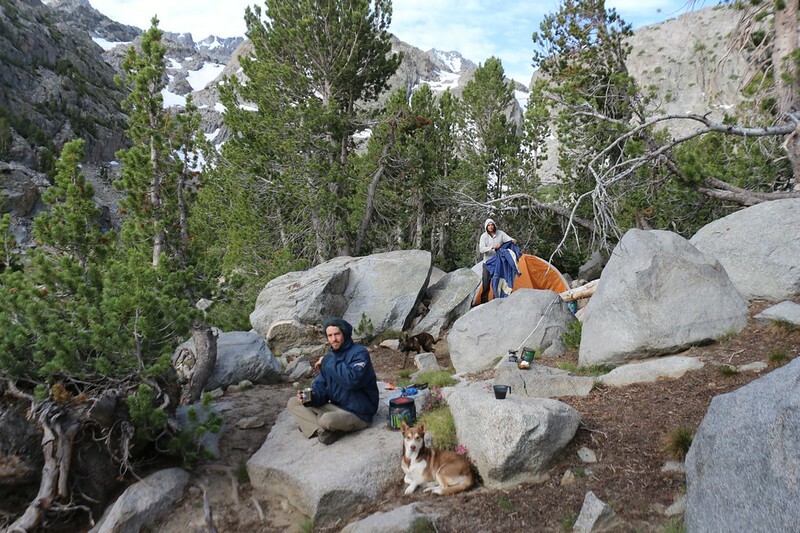 The guys had a really nice spot up on a small rise with some shade, but I wanted to camp at a short distance from them. Today was too easy of a hike and I knew they’d stay up late yakking and laughing; they weren’t tired enough yet. And I simply desired peace and quiet. We would be staying here two nights, so I wanted to enjoy it thoroughly. It didn’t take long before I found a small spot a bit further from the lake and set up my tiny one-man tent. I got everything arranged the way I liked it, then headed back to the main camp. We hung out for a while, then went off to the lake’s inlet stream to filter a few gallons of water. While filtering, we took in our surroundings. 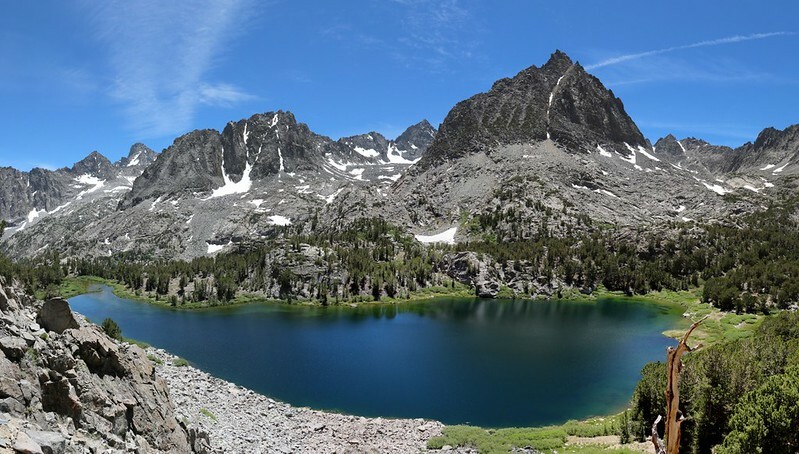 This lake, Seventh Lake, at 11180 feet elevation, was the highest lake on the North Fork of Big Pine Creek (not counting the tiny icy pond at the bottom of the Palisade Glacier). The fact that there was no trail to get here made us extra happy, as there was a good chance we’d have the entire lake to ourselves. And the view from up here was stunning. 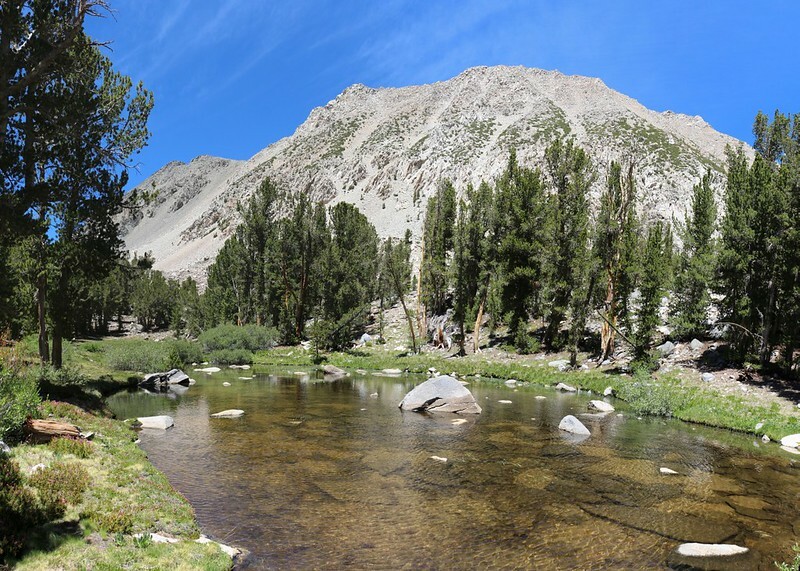 This end of the basin was dominated by Two Eagle Peak (12966 feet) and Cloudripper (at 13525 feet), plus other distant peaks could also be seen to the southeast. We stared at Cloudripper quite a lot, and I pointed out tomorrow’s route to the guys. It looked like the dogs could make it, but from this distance it was hard to be sure. In the end, there was really only one way to find out. We went back to camp and I watched them cook dinner. Once again, the guys ate two dinners. The dogs ate everything in sight. They were making me hungry. All I had was no-cook food, but that was OK. It was all “junk food” consisting of salty snacks and sugary treats. Perfect vacation food, in other words. So I went back to my tent and started munching out. It got cooler as the sun sank behind Cloudripper. So I put on some warmer night clothes, then sat with my legs inside my sleeping bag, reading my book and filling up on snacks. Everything was peaceful for a while, when suddenly I heard voices nearby. Oh no! Were more people showing up to camp at our beautiful lake? And then I listened some more. These were female voices, and they were coming from further up the valley. I hurriedly left the tent and stood on a nearby granite slab in my socks, looking around for the source. Lo and behold! It was the three ladies! But they hadn’t seen me yet. “Did you guys bag Cloudripper?” I shouted out to them. I waved my arms and they saw me. They carefully picked their way down the talus slope to say hello. The dogs started barking and then everyone converged on my tent. It was like old home week. “How was the view from up there?” I asked the leader. “You can see everything!” she exclaimed. And that was exactly what I was hoping for. We got to hear about how one of the girls almost quit and turned around partway up to the saddle, because she was so utterly exhausted, but then somehow she found the willpower inside her to keep going. And she made it to the summit. She was proud of herself, and rightly so. We could see the peak and the saddle from where we were, so I asked about the route. The leader-girl told me to stay to the right as we headed to the saddle, as the blocks of talus were much easier to climb than the loose scree to the left and center. This was good to know. I asked what they thought about the dogs getting to the top, and they said that most of it was fine, except maybe the final climb onto the summit block. Not only did they have two miles yet to hike, they were also wearing shorts, and the air was cooling off rapidly as the sun headed down. The only way for them to stay warm was to keep on moving, so we said good-bye and wished them well on the rest of their trip. Then they headed off cross-country for the main trail on their way to Fifth Lake. Talking with the girls really left us stoked for tomorrow’s hike. We, too, would soon be up on the summit of Cloudripper, and we, too, were going to see everything!